What a game! The good news for the Dodgers is that they won’t have to go back to Fenway Park after tomorrow where it’s cold and people say mean things. 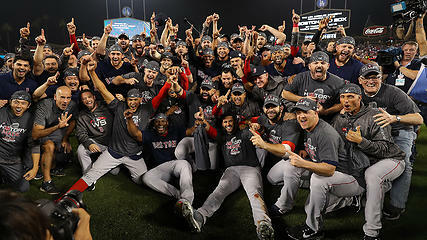 The Red Sox are World Champions again! How do you like them apples?!? 2004, 2007, 2013, 2018 and looking good for a few more years! I Take full credit for amazing performance of bullpen based on my reverse-psychology post on Ms thread. In my family we all eventually became Mets fans after the Brooklyn Dodgers betrayed us before my birth. I got my start with the Amazing Mets of 1969. That said, I could never support an American League team, especially one from Boston, so go Dodgers. Those of us who were BROOKLYN Dodger fans in 40s/50s learned to hate Yankees because Dodgers lost 5 of 6 world series to them. So when Dodgers moved to LA and we disowned them, Red Sox were, after several years of mourning, a logical substitute for some of us. Thank you for that. LOL. Personally I think that Alex Cora is a psychological mastermind and a sheer genius. He got the best out of everyone in that lineup and bullpen, top to bottom. Any other manger might not have pulled off what he was able to. It's my understanding that when Francona left the team he was fed up with meddling from the front office. I really hope management gives him the latitude he needs to keep this up. If so, we could be talking about a dynasty. Ain't it great to be a Sox fan in 2018? Amazing to think that 20-something-year-old Sox fans have no idea what the rest of us have gone through. I watched the attached video the other day and I couldn't help shedding tears of joy. 1) The Red Sox are on the road for the first two weeks of the season. While the M's first home game at Safeco Field/T Mobile Field is on 3/28, the Sox don't play at Fenway until 4/9. Does anyone else think that's weird given the fact that the Sox haven't played at Fenway since game 2 of the World Series? I doubt the NFL would do this to the champs. 2) Red Sox tickets aren't on sale yet. I would think that all MLB teams would start their ticket drive on the same date. I prefer MLB to the NFL lately but these factors seem odd to me. Meanwhile in Boston, the Red Sox re-sign Nasty Nate! The Red Sox are off to a great start and picking up right where they left off! They beat the Yankees today in the first game of Spring training. Opening day home game at Fenway West is just over a month away! The champs are on their way. T-2 days to the home opener at Fenway West! Great video. Can’t wait to get to Fenway West at 1:00 today. It’s a whole new year! Today’s the day! The champs are back home to get right! And today we crown last years champions! Did anyone else catch the ring ceremony? If not you can watch the world champions get their rings on NESN’s Facebook live channel. If was fun watching the players from the start of the dynasty until now walk onto the field, especially Man Ram.